I’ve been hearing of Mass Super PEKKA (MSP) armies wreaking havoc all over in the 4000s, so I decided to do some tinkering. She starts off with 3000 hit points and nearly doubles that to 5,845 hit points at level 16. Her damage per attack goes from 549 all the way up to 1069 at level 16. Her ability, the Overcharge, is a very modest 400 at level 2 but triples at level 16. This troop is an absolute beast at level 16. As I’ve mentioned elsewhere, I already have the Super PEKKA upgrading with all the loot I’m getting during Battlefest. I finally have her up to level 8. I tested her at level 4 - meh. Level 6 - meh. Level 8…well, I just got level 8 a short bit ago, so I need some time to play with that level before rendering a judgement but…not so impressed yet. BUT…I *REALLY* wanted to see this troop in action - especially with all the talk of how it’s just tearing things up - so I decided to use one of those magical blue potions to boost her to level 16. All I can say is that this is absolutely, positively the most fun spam attack in the history of spam attacks. Baby Dragons were ok; Beta Minions were reliable and highly functional; Night Witches were lots of fun; but the Super PEKKA is just an absolute blast. Now, of course, no troop is perfect and the Super PEKKA is no different here. Some problems I’ve noticed…. First and foremost - this troop likes to clump together, much like the Drop Ship. Sometimes she seems to actively seek out her sisters in arms. As such, the troop is highly susceptible to splash damage. That means you really want to deploy them spread out and hold back on a couple to backfill as one goes down. I tried a couple of mass drops - just putting all 6 in the same place - and it did NOT work out well. That said, they also do massive damage when they run in pack. The Guard Post troops can be an issue for the Super PEKKA as they draw her away from her intended path. I’ve seen them follow Guard Post troops for several squares and, after destroying the troops, they pick up with their attack from that point leaving all kinds of things behind (not to mention getting pummeled by higher order defenses in the middle). The AI does that same target and re-target thing that we’ve all come to know and love in the Battle Machine BUT…she re-targets more quickly. Whereas the Battle Machine hits its boredom point at about 7 seconds, it seems like the Super PEKKA hits that same point somewhere between 4 and 5 seconds. The Push Traps just throw these troops around like rag dolls. You’ll see this in the replays but man oh man, do they go flyin’. To be honest, I found this a little surprising as I really didn’t expect it anymore so than the Battle Machine being affected by Push Traps. True, Spring Traps have no impact but Push Traps will definitely be a key defense against the MSP attack strategy. Deployment of the Mass Super PEKKA attack strategy is very straightforward. I either look for existing points of ingress in the base and use those, or I pick the facing side, preferably where I won’t get pummeled by a ranged defense like the MultiMortar (often not possible). I try to spread them out a bit for maximum damage and I often hold back on the Battle Machine, giving them time to really soften the base up. I don’t think you’ll want to keep the Battle Machine out until the end like we do with Minion Drops though, just wait until you’re a bit further in on the attack. They work well together to take down defenses. Unlike other attack strategies, there really wasn’t any one particular side that was better than another - if there was an area where junk buildings were grouped, I would usually pick there (maximum initial damage) but other than that, it really didn’t matter much. No one defense really does more damage than another either. The one thing I’ve definitely picked up on here - those bases where there’s a big, open space in the middle and walls around the outside…? Yeah…those bases will be dead as soon as the Super PEKKA becomes a more commonly used troop, especially in the 3800-4500 trophy range. MSP will absolutely rip through bases like that with mix-level defenses. I am now absolutely on the wagon for the lethality of the GiBoCC and GiBoCCa attack strategies but I found that neither really worked well at higher play with L14 troops. The strat really needs the additional units you get at L16. Of course, I couldn’t test this because although the potion will boost troop LEVELS, it does not increase the number you get per camp (even though that is in fact part of the troop level on the BB). So…there you have it, a first look at the Mass Super PEKKA attack strategy. Lots and lots and LOTS of fun, this one. I’ve included a video with some replays (linked below). Last edited by Noctaire; March 10th, 2018 at 11:32 PM. Thanks for sharing! I’ve used 3 potions and I absolutely love her! I’ve got quite a few 100% and some very high attacks with her. Of course...once she is upgraded to level 16 on most player’s accounts (could be up to 2-3+ months since we will be prioritising all the other upgrades), you have to remember that all the defences will be BH8 level too. Effectively we are attacking BH7s with the Super PEKKA at the moment. I think once the bases are upgraded further, Super PEKKA will still be good but won’t decimate bases like we are seeing her do so well now! I still haven't upgraded any BH 8 troop. You all think I should start with pekka until I max her or should I start with dropships and minions or even giants and cannon carts? It’s certainly not worth it to start upgrading her now from level 1 to 16 before focusing on your other troops to 16. Since I’m assuming your other troops are all level 14, upgrade either ground or air or both depending on what you use and once they are maxed, then start the pekka. Otherwise, you will struggle greatly when everyone else has higher troops than you when attacking! Awesome! I can't wait to have another quality spam attack as part of my repertoire. I'm thinking to cycle through trophies again just to enjoy each of them at their peak such as mass bd's, witches, and of course the indomitable raged barbarians. Nah; this is another one where the defenses will catch up and negate the mass spam attack, just as it did with each of the others. In the short term, though, it sure is fun! No. I mention this in both my videos and articles (Upgrade Guide and this one). Super PEKKA is lots of fun - and she could easily get you to 5K in no time at all as a L16 troop under the current meta - but she’s also starting out at L1. That means 40M in elixir and something like 54 days of lab time to get her to L16, not to mention the actual time to drum up all that elixir (which is the real time determinant). I think you’d be far better served to max your primary attack strategy, maybe even that and the secondary, before considering the option of upgrading the Super PEKKA. The exception here - with Battlefest going on, we are just drowning in elixir right now, so it is a good opportunity to get a jump on the nearly 2 months long upgrade time. That’s what I’ve been doing - I raid like a mad man, then gem or BoF the lab timer when I have enough for the next level up to begin. Even with that, though, I’ll only shave about 3 weeks off the nearly 8 weeks required to get her to L16. I will likely do one more level before I backburner the SP in favor of my regular upgrade order (Beta Minions, Drop Ships, Boxer Giants, Cannon Carts, Bombers, Night Witch, Raged Barbarian...) then I will pick it back up at some point toward the middle of of the rotation. Last edited by Noctaire; March 11th, 2018 at 02:30 AM. I used the potion to get SP16 to do the SP challenges in Builder Games. First attack was 84% 2-star, then I adjusted deployment and from then on it was 100%. BM was relegated to being there to distract some defenses and pick up scraps. I played knowing that by the time my SP is actually level 16 bases will have many upgraded defenses, so I enjoyed it while I could. 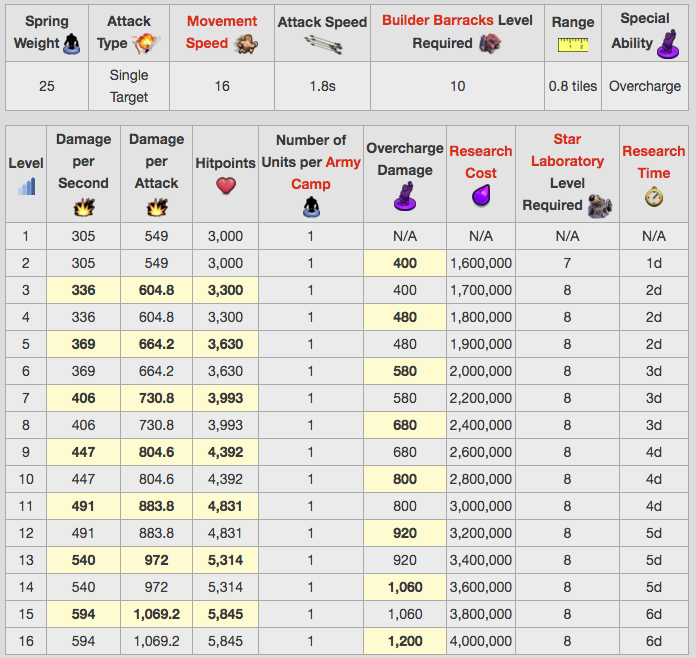 Regarding that wiki chart, I think the overcharge damage is wrong... when I upgraded my SP to lvl2 it says the overcharge damage is 500, not 400. What it actually inflicts in the game, I don't know. Overcharge didn’t inflict a whole lot of damage at the lower levels. Even my SP8 tests haven’t proven to have much oomph. I used a power potion on her last night. I wanted to get to a higher loot bracket before the end of battlefest. It was a blast. On my clock boost it was SP all the way; lots of 3*s. I then went with 5 SPs & a camp of bombers. I found it was just as devastating; the SPs weren't taking as much splash damage when the bombers cleared a path. I'm looking forward to L16 bombers & SP's working in tandem, as I'll have 5 of each to buddy up. I finally got the SP to L10 this morning. I’m using Gems to reset timers (loot and upgrade), taking advantage of the additional “Duel Bonus” we are getting during Battlefest. Unfortunately, she’s still going down and fast. I’ve tried her in MSP and a few hybrid army comps; results have been pretty much the same. The Overcharge is finally hitting a decent damage point but on her own, she’s just not cutting it and that’s been real disappointing. Even bases she absolutely throttles at L16, I can’t get the second star with her at L10. Last edited by Noctaire; March 11th, 2018 at 04:53 PM.